Dr. Kopelovich is a Board Certified Physical Therapist, Certified Strength and Conditioning Specialist, and a Fitness Instructor. Alexandra graduated from CUNY, Brooklyn College with a Bachelors degree in Exercise Science and from Touro College with a Doctorate degree in Physical Therapy. Dr. Kopelovich gained valuable experience during various clinical affiliations at Mount Sinai/Beth Israel Hospital, Rehab Associates of Brooklyn, Kingsbrook Jewish Medical Center, and Sports Therapy and Rehabilitation (STAR) Physical Therapy. In addition to being a Physical Therapist, Alexandra is a competitive ballroom dancer. She is currently one of the highest ranked Championship Rhythm dancers in the country and was a 2014 National Finalist. In her free time, Dr. Kopelovich enjoys swimming, skiing, and designing ballroom dance costumes for herself and others. Currently, Alexandra is determined to complete the full NAIOMT series of courses, which will allow her to complete her goal of becoming a Certified Manual Specialist. Rimma graduated with a Doctorate Degree in Physical Therapy from The Graduate Center of The City University of New York in 2010. She specializes in pediatric physical therapy and has extensive practice in a variety of pediatric settings. She is highly experienced in the treatment of a multitude of musculoskeletal, neurological and orthopedic disorders. Through her extensive use of evidence based practice and research, Rimma strives to provide the highest quality of care to each and every one of her patients. As a pediatric physical therapist, she feels privileged to be able to play a role in improving a child’s life. With a lifelong passion for helping people, Rimma completed her Medical Doctorate at the I.Horbachevsky Ternopol State Medical University in Ukraine. Upon immigration to the United States, she has also obtained a New York State Registered Professional Nurse License. She is constantly learning, taking numerous continuing-education courses to stay up to date with the latest research practices in pediatric physical therapy. Dr. Liudmila Lahonda, DPT, CKTP is a board certified physical therapist. Liudmila Lahonda graduated from Queens College with a bachelor’s degree in Dietetics and earned her Doctorate degree in Physical Therapy from SUNY Downstate Medical Center. 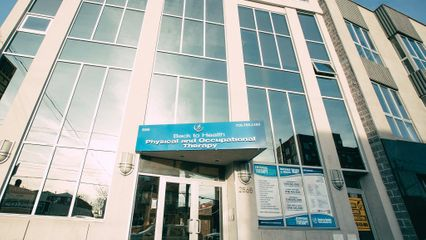 Liudmila has received considerable experience during her clinical affiliations at University Hospital of Brooklyn, Upper East Side Rehabilitation Center, Rahab Associates of Brooklyn and Back to Health Physical Therapy. Liudmila’s particular interest is in Manual therapy, post-injury/post-surgical orthopedic rehabilitation, back pain and scoliosis. Liudmila sees herself as continually growing in her field, learning, and excelling her skills. She started taking manual therapy courses through NAIOMT and determined to become Certified Manual Specialist. Liudmila is dedicated to every one of her patients. Her purpose is to make them feel better, improve their performances and achieve their goals. In her free time, Liudmila enjoys outdoor fun activities and spending time with her family. Dr. Aleksandr Dekhtyarev received his Doctorate in Physical Therapy from the New York Institute of Technology in 2008. His professional career kicked off at the Kingsbrook Medical Center where he was recognized as the Employee Of The Year for his impeccable work ethic and patient care. In his time spent working at Kingsbrook Dr. Dekhtyarev was able to hone his skills in traumatic brain rehabilitation, cardiac rehabilitation, post-surgical orthopedic rehabilitation, and bedside treatment. Dr. Dekhtyarev proudly and efficiently juggled work at the medical center as well home care for early intervention and long term care. Dr. Dekhtyarev, despite all of his responsibilities, also managed to work into his schedule being an adjunct professor at NYIT, as well as a mentor in the hospital to physical therapy students and medical residents. Here at Back To Health, Dr. Dekhtyarev spearheaded a mentor program for Doctorate students and medical residents currently enrolled at NYIT and Columbia University. Dr. Dekhtyarev is committed to progressively and diligently improving his techniques and skills, while also constantly attending Continuing Education courses in orthopedics and sports medicine to continue adding the latest and greatest in patient care to his already abundant set of skills. Dr. Michael Goynatsky is a diligent and dependable Physical Therapist serving the South Brooklyn area. Dr. Goynatsky was a Division 1 Soccer player at St. Francis College during his undergraduate career and subsequently attended the University of South Florida, where he received his Doctorate in Physical Therapy. Dr. Goynatsky practices at Back To Health Physical Therapy, where patients see him for a variety of reasons including therapeutic exercises, hand problems, elbow problems, manual therapies, and ankle problems. Because Dr. Goynatsky is bilingual in English and Russian, patients from a variety of backgrounds enjoy having him as their trusted Physical Therapist. Dr. Goynatsky is uncompromising in his dedication to the well-being of his patients. He is committed to giving the best care and establishing long-lasting relationships with them. Tatiana Bulanov was born in Moscow, Russia where she attended the Moscow Central University of Physical Culture, majoring in Remedial Therapeutic Exercises and Coaching in Archery. She completed her dissertation in Sports Sociology as part of her Post-Graduate Studies. After immigrating to the United States in the early 1990s, Tatiana attended Mercy College, aiming for a degree in Physical Therapy. Working as a Physical Therapy Assistant throughout the week at the Rehabilitation Department of Coney Island Hospital, Tatiana joined a weekend-study program. Though it was difficult to manage both going to school and working full-time, Tatiana managed to persevere and obtain her Master’s Degree in Physical Therapy. She continued to work at Coney Island Hospital as Physical Therapist, where she provided treatment to variety of patients, as well as supervised and trained PTAs and PT students. In 2000, Tatiana started her work with pediatrics at the Garden of Health and became the Clinical Director of I&T Early Start, where she ran continuing education workshops for pediatric physical and occupational therapists around the country. In 2002, Tatiana joined the Department of Education, where she provides high-quality physical therapy for children with multiply disabilities as a Senior Physical Therapist. Tatiana also continues her education today, attending lectures, seminars, and symposiums regarding a range of topics for pediatric physical therapy. She completed her certification in infant massage therapy, neurodevelopmental facilitation, pediatric yoga, and pediatric kinesio taping. Tatiana joined the Back to Health team in November 2016 as a pediatric PT. She prides herself in being professional, courteous, and knowledgeable about her skills, which along with her proficiency in both Russian and English and years of experience, allow her to deliver top-quality care to all her patients. Boris Vorik, PT, DPT received his Doctorate in Physical Therapy from The Graduate Center of The City University of New York. He excelled in the classroom, clinic and lab and was awarded Highest Academic Honors for his outstanding educational performance. Boris has practiced in a variety of settings including outpatient orthopedics, acute care, home-care and neurological with a particular interest in vestibular/balance rehabilitation. While at the Graduate Center, he participated in research projects, one of which, 'The Relationship Between Range of Movement, Flexibility, and Balance in the Elderly’ has been published in the Topics in Geriatric Rehabilitation journal. Since joining «Back to Health» Physical Therapy, Boris has had an opportunity to apply his methodology and knowledge to directly address impairments, enabling a faster recovery while emphasizing patient education and prevention strategies. In his spare time, Boris enjoys traveling and living a well-balanced healthy life. Dr. Daniel Lerner is an Orthospine Rehabilitation specialist at Back to Health Physical and Occupational Therapy. Dr. Lerner worked as clinical neurophysiologist consulting orthopedic spine and neurosurgeons on intra-operative neurological deficits, performed intra-operative testing for peripheral nerve grafting, assisted with Coratid endarterectomies by monitoring electroencephalograms, and performed brain mapping for seizure focus resections. Dr. Lerner graduated Dominican College in 2011 with Doctor of Physical Therapy degree. During his time in college, Dr. Lerner built a bridge between Chiropractic Biophysics Seminars and Dominican College by launching a case series on the topic of lateral displacement of cervical spine and its effect on pain. Post graduation, Dr. Lerner enrolled in a one year training performing nerve conduction and electromyography studies identifying neurological diseases with Hands on Physical Therapy. Dr. Lerner has a clinical interest in the treatment of the following conditions: cervical, thoracic, lumbar disc disorders, cervicogenic headaches, peripheral vestibular disorders, Idiopathic, congenital, neuromuscular scoliosis. Dr. Lerner recently launched an orthospine rehabilitation program at back to health physical and occupational therapy targeting patients with above mentioned conditions. Dr. Daniel Friedman is a Board Certified Physical Therapist. Daniel graduated from CUNY, Brooklyn College with a Bachelor of Science degree in Exercise Science and from Touro College School of Health Sciences with a Doctorate degree in Physical Therapy. Dr. Friedman gained valuable experiences during his various clinical affiliations at North Shore LIJ, Ahava Medical Center, Aqua Rehabilitation Center, and Rehabilitation Associates of Brooklyn and is well rounded in treating outpatient orthopedics. Dr. Friedman has a passion for orthopedics and manual therapy. While he was still a student, Dr. Friedman started pursuing his CMPT (Certified Manual Physical Therapist) certification with NAIOMT (North American Institute of Orthopedic Manual Therapy) and continues to take courses to achieve that goal. Dr. Friedman is a caring physical therapist that is committed to growing his skills and prides himself on providing high quality care, tailored to each patients unique and individual needs. Dr. Friedman is also a member of the American Physical Therapy Association. Dr. Gleb Kartsev graduated with a Doctorate Degree in Physical Therapy from New York Institute of Technology in 2016. In current practice Dr. Kartsev predominantly works with musculoskeletal disorders, sport, work related injuries, and post operative rehabilitation with strong accent on manual therapy. Dr. Kartsev constantly learning, incessantly taking continuing-education courses in order to expend professional knowledge and stay up to date with the latest research practices in physical therapy field. Jerome Cabahug, PT is a licensed Physical Therapist specializing in treatment of orthopedic and neurological dysfunction. He graduated with Bachelors in Physical Therapy in 2001, and had since acquired extensive experience in the field of physical rehabilitation. Today Jerome stands in top category of professionalism, care and knowledge. In his free time Jerome enjoys his family and training his kids to play soccer and various athletic games. Loverna Abella, DPT is a fully licensed Doctor of Physical Therapy at the Newkirk Back To Health Clinic. Loverna always loved helping people, and decided to become a physical therapist. Eliminating pain and bringing people back to their full potential is why Loverna does what she does. Being a doctor for a number of years has allowed Loverna to gain heaps of experience and perfect treatment practices. During her spare time she loves to read books, bicycle riding, and playing tennis! Yakov Ostrovsky is a Chicago Medical School graduate from their Physical Therapy program. Mr. Ostrovsky worked at the Hospital for Joint Disease Orthopedic Institute, a leading orthopedic institution where he developed paramount standards for practice excellence. Yakov Ostrovsky is a caring, emotionally supportive individual. He is a Physical Therapist who is always available, ready, willing and able to provide treatment and education. Specialties: Complicated Orthopedic Conditions, Post Orthopedic Surgeries Rehabilitation, Fractures and Trauma. Sohib Kotb, DPT is a fully licensed Doctor of Physical Therapy who graduated Touro College back in 2014. Sohib has been practicing physical therapy for over four years gaining valuable knowledge and experience daily. He’s very kind, easy-going, and meticulous with anything that he does. Bringing people back to health is his favorite hobby. But besides that Sohib enjoys playing Soccer as well as Swimming.